Over the past several months work has been conducted on a feasibility study looking at the opportunities available for the development of a small scale soybean processing facility in Ontario. With soybean production continuing to grow throughout the province and significant production growth seen in Western Canada, increased processing capabilities are needed within the province. The initiative is the first of its kind in Canada with participation from across the value-chain, including farmers, academia, and the private sector. Grain Farmers of Ontario was successful in receiving funding for the feasibility study work through the Growing Forward 2 — Organization and Collaboration Program. Funding received went towards the investigation of market opportunities for both the oil and meal, investigation into specialized equipment, as well as identifying alternative energy sources. The development of a small scale processing facility in the province will create new opportunities for Ontario soybean growers and continue to push Ontario as a global agriculture leader. The federal government’s proposed tax changes continue to be revised and the full impact of their implementation will not be known until some clarity is provided around new rules for income splitting and passive investments. 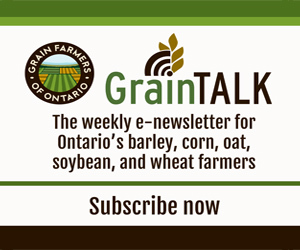 Grain Farmers of Ontario was an early member of the Coalition for Small Business Tax Fairness, a group that is now made up of more than 70 organizations, which was effective in making its message heard about the problems with the original proposal for tax changes. In addition, Grain Farmers of Ontario chair Mark Brock presented our position to the Senate’s National Finance Committee on Tuesday, October 24, highlighting our ongoing concerns despite the revisions. Brock also appeared on the Business News Network in September explaining how the proposed changes will impact farm transfers to the next generation. He noted that the changes add both complexity and uncertainty to the process, particularly for young farmers under 24 years of age who are trying to establish themselves in farming. Ron Davidson has officially been selected as the new executive director of Soy Canada, effective November 1. Davidson has held multiple senior positions in professional organizations in both the public and private sectors and has extensive international and diplomatic experience working for the Government of Canada in various diplomatic postings. Davidson also held senior roles in both the Departments of Foreign Affairs and Agriculture. With a full-time leader now in place, Soy Canada looks forward to continuing its work to facilitate industry cooperation and represent the industry on domestic and international issues affecting the growth and development of the sector. The October United States Department of Agriculture (USDA) report increased U.S. national corn yield but decreased the estimated U.S. soybean yield. USDA increased U.S. national corn yield to 171.8 bushels per acre, an increase of 1.9 bushels per acre over their September estimate. USDA estimated soybean production to be at 4.431 billion bushels, which was based on a .4 bushel/acre cut in U.S. national yield down to 49.5 bushels per acre.